Plan to provide your flowers in a timely fashion, for best results 1-3 days after the event. You can visit our studio any time during business hours Monday-Saturday. To get started, we require a 200.00 deposit at the time of drop off. Our process begins with quality evaluation before drying the elements of your bouquet. 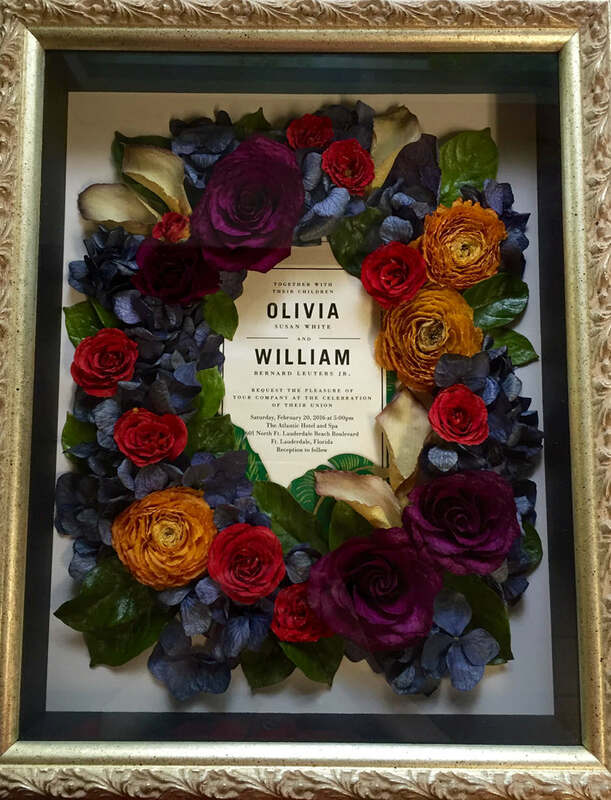 Choose your design style, your frame and decide what memories you would like to include like an invitation or add a custom initial or monogram. 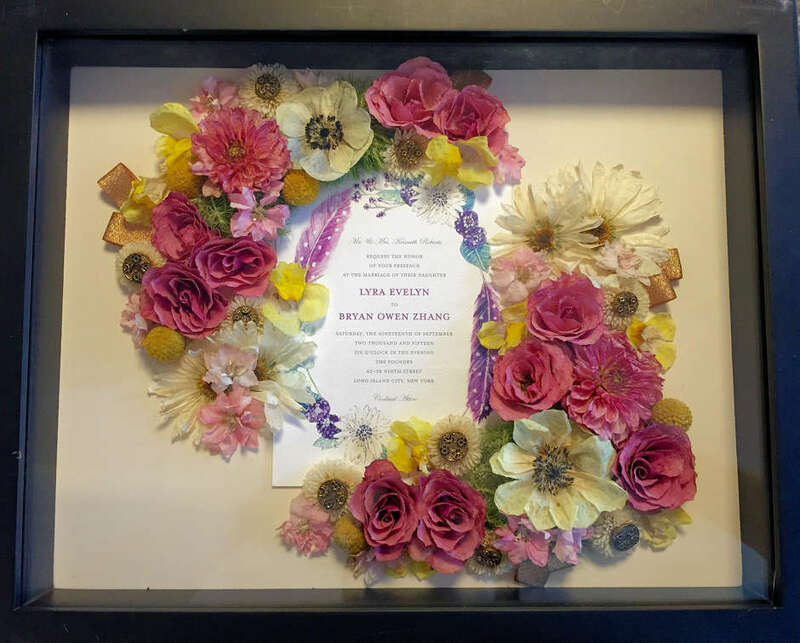 The size of the design will determine the amount of details, flowers and elements that can include in your shadow box. You can expect the first phase of drying to take 8-10 weeks. Once your flowers are ready, we will contact you for approval of your sample design layout. We look forward to creating your custom design with your memories! To display any size hand tied or cascade bouquet and include additional keepsakes, invitation, photographs, etc. After the wedding, please provide your bouquet as soon as possible, or within 1-3 days for best results. Please be mindful that bouquets are made of delicate and this makes delivery time sensitive. Keep the bouquet at room temperature and out of the refrigerator, place in a vase and keep base of stems in an inch of water. The bouquet flowers should remain dry, do not spray or saturate with water. We are available to receive bouquets in our store any time during our studio hours Monday- Saturday. Also keep in mind that dried flowers will turn into a deeper color hue. For example whites will appear cream/beige and reds will appear dark burgundy. You can expect the first phase of drying to take 8-10 weeks. If you are out of the area, you can overnight ship your bouquet, following our shipping guidelines. 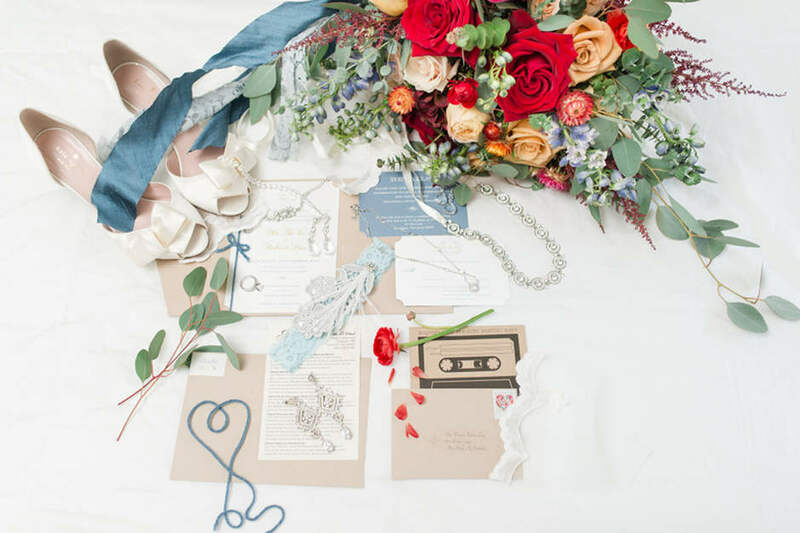 Dried flowers will deepen in color from your original fresh blooms, shades and hues will naturally darken. For example whites will appear cream/beige and reds will appear dark burgundy. While most flowers will dry successfully, there are a few exceptions due to the high moisture content. Examples of these flowers are tulips, succulents, gardenias and stephanotis. We offer replacement services to replace a few blooms or even can recreate your bouquet. If it has been more than one week after the wedding. Send us a photo of your wedding bouquet, we will recreate and capture the look of your original bouquet. Also, this makes a unique anniversary gift! Download to review your Floral Preservation Terms and Conditions for bouquet preservation process and guidelines.